Hartford Courant, Sunday August 31, 2003. As a professor of “ice-age” science, and as one who liked glaciers enough to get married beside one, I take issue with the poet’s destructive view of ice. True, the passage of an ice sheet over a landscape does evict life, poets included. But the passage is only temporary and does not destroy the land. In fact, the entire Connecticut landscape is a gift of the glacier. Our safe harbors, historic mill sites and early farm economy were made possible by an ice sheet that oozed down from Canada between 25,000 and 15,000 years ago. The ice sheet also gave us fertile lowlands along our large rivers, gracefully curved upland pastures, gravel riffles in trout streams, verdant marshes fronting shoreline villages, a patchwork of stone walls, bricks for colonial buildings and solitary boulders, stranded here and there as if they were hillside shipwrecks. All of these are glacier gifts. Yet it is Frost’s notion of “ice-as-destroyer” that they teach in school. In this version, a jagged, mile-high cliff of brittle ice grinds its way to Long Island Sound. Stones are crushed in the shear zone between bedrock and black ice. Ledges are scoured by relentless pressure. Finally, the ice withdraws, leaving a scene of rocky desolation. The Connecticut River Valley — the broadest, loamiest, most fertile stretch of agricultural land in New England — is a glacial gift. Formerly the site of a tropical salt lake during the Jurassic period, this area was glacially deepened, then dammed to form a shallow, turbid lake whose shores shoaled with sand-moving waves. When it finally drained about 12,000 years ago, the stone-free bottom of the lake would become the breadbasket of New England. Its clay-rich mud — when mixed with sand, molded and fired in a kiln — would become brick for building America, then and now. Above the valley is the gift of green hillside pastures. These rolling hills remain lush — even during late summer, the result of a layer of glacial hardpan immediately below the surface. This hardpan — more properly called lodgment till — was plastered onto the landscape by slowly moving ice. In the process, rock crevices were filled, rough outcroppings were swept away or buried and the land was smoothed into beautiful streamlined hills. Most important, the hardpan, being virtually impermeable, keeps the water of summer rains within reach of plant roots. Farther downhill, water is filtered by its passage through aquifers created by meltwater streams. Having been rinsed free of mud, these masses of sand and gravel hold and release groundwater, steadying the flow of streams. Additionally, most colonial mills were located where this flow cascades over bedrock narrows, places that were plumbed by the flow of pressurized water beneath the ice. Industry in New England owes its hydropower beginnings to the glacier. Stone walls, the signature landform of rural New England, are my favorite glacial gifts. Crisscrossing nearly every village and town, they were built as upland farmers rolled, dumped and stacked billions of glacial stones beneath wooden fences. During the last ice age, these stones were plucked from nearby ledges, spread over the land and dropped in place, just before the last ice melted. Farmers reversed the process, picking them up, scuttling them aside and concentrating them into walls, as if they were rebuilding what the ice had torn apart. From Stonington to Greenwich, each of Connecticut’s shoreline towns is located where an erosive tongue of glacier ice deepened an old river channel. Then, sea level rose, converting these rock channels into deepwater harbors behind ice-scoured hardrock headlands. The sand washing on those town beaches came largely from offshore patches of glacial sediment. The marshes behind the beaches developed as the pace of sea level rise slowed during the past few millennia (there was less ice left to melt on the globe). The glaciers also left us with a grab bag of odds and ends. Colossal boulders the size of cars (erratics) dot our towns; each was laid down gently as the ice thinned to zero. Stair-step benches in valley bottoms (kame terraces) show us where gravel-braided streams cut themselves downward, one notch at a time. Sinuous bouldery ridges (eskers) indicate places where tunnels beneath the ice became backfilled with gravel as the meltwater flow waned. Ponds and vernal pools mark places where blocks of ice, detached from the main mass, were buried by water-washed sand (kettles). Odd hills are often dunes, built when strong cold winds swept up a local surplus of glacial shoreline sand. The most precious glacial gift of all is Long Island Sound. Its placid waters are protected behind Long Island, built during spasms of glacial dumping and thrusting at the outermost edge of the ice sheet. This ice-pushed “moraine” barrier gave early settlers the extra dose of protection they needed to establish permanent footholds on otherwise hostile shores. In some ways, Connecticut is like a medieval castle, protected by the moat of Long Island Sound. The outer wall of that fortress — Long Island — should be ours as well, especially since it consists of crushed-up Connecticut. Scientists now know that the world will end in fire. Approximately 5 billion years from now, Earth’s sun will run out of nuclear fuel, expand into a red giant and hot-flash the Earth back into the vapor from which it was born. Until then, the worst hazards we face are urban blight, pollution, endless sprawl and the homogenization of the landscape by a species (Homo sapiens) no longer constrained by the use of natural materials. Perhaps the solution to all our environmental woes is patience. If we wait long enough, Nature will send her ice sheet down from the north to erase what we have wrought in the name of progress, then restore the landscape to the way it looked when Adriaen Block first sailed up the Connecticut River. That scene was a gift of the glacier. Some say the world was made by fire. 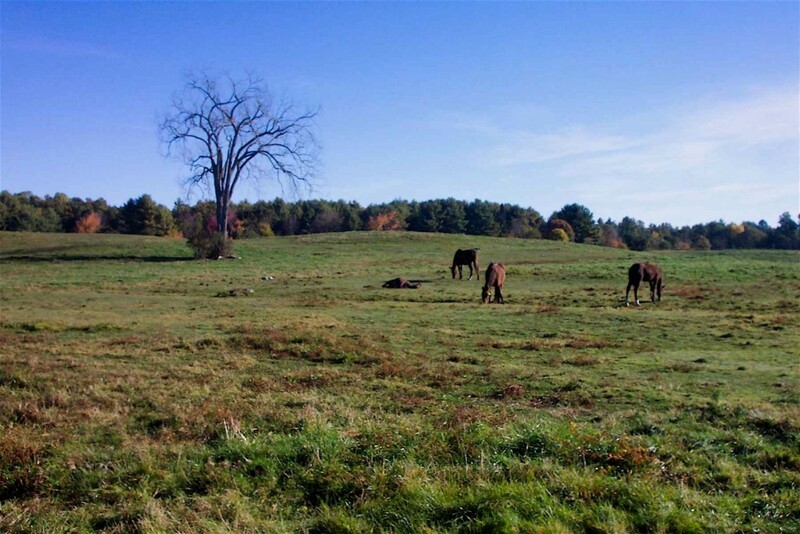 Photo: Horse pastures are often on drumlins underlain by lodgment till.